Linn launches limited edition 'Whisky Cask' Sondek turntable | What Hi-Fi? Like vinyl? Like whisky? Then Linn and Highland Park have just the thing. To celebrate Linn's 40th anniversary, the company has launched a limited edition Sondek turntable – encased in a wood plinth made from whisky casks. 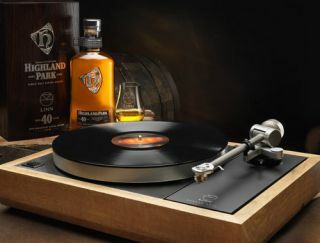 The 'Whisky Cask' Sondek record player has also been paired with a special bottling of Highland Park 40 year old whisky, designed exclusively for Linn. Sounds like a fine combination to us. The Sondek LP12 turntable was the product upon which Linn was founded, designed by Linn founder Ivor Tiefenbrun and originally introduced back in 1972. Hugely popular amongst hi-fi enthusiasts and music lovers the world over, the Linn Sondek has had many incarnations since but remained its familiar, iconic design. There are just forty Limited Edition Sondek LP12 turntables available worldwide, each with the wood plinth. The plinth is made from the solid oak casks used to mature Highland Park's award-winning whisky. Highland Park is one of the most remote Scotch whisky distilleries in the world, founded in 1798 on Orkney in Scotland. Linn is based near Glasgow in Eaglesham, East Renfrewshire. Linn's 40th Anniversary Highland Park Limited Edition Sondek LP12 – to give it its full name – comprises a Kandid moving coil cartridge and Ekos SE tonearm. There's a Keel sub-chassis and armboard Radikal DC motor and power supply, plus an Urika phono stage. And don't forget that still smelling of whisky plinth (perhaps). Fancy getting your hands on one of the forty turntables? You will need to be quick (probably) and also need £25,000... Contact your local Linn specialist retailer should you be ready to splash the cash.